Southcentral Alaska Northern Pike, 34 minutes, color, © 2003 by State of Alaska, Department of Fish and Game, Division of Sport Fish. All rights reserved. For individual and educational use only; fees may not be charged for public viewing. ADF&G Sport Fish Southcentral Region, 333 Raspberry Rd., Anchorage, AK 99518; (907) 267-2218. This video was shot under the terms of a special permit issued by the Commissioner of the Alaska Department of Fish and Game. Not all methods may be legal in your area. Check the regulation booklet before heading out to fish. 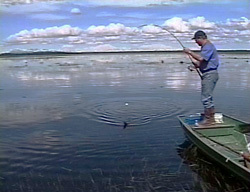 Northern pike are a prized subsistence and sport fish in their home range, north and west of the Alaska Mountain Range. However, illegal introductions of pike into Southcentral Alaska rivers and lakes have reduced the numbers of Chinook salmon, coho salmon, rainbow trout, and char available to anglers. The Division of Sport Fish has put together this instructional video to show you the many ways Pike can be taken in Southcentral. Find out which open water lure pike will chase and attack from yards away. Watch pike after pike caught by using spears, bow-fishing equipment, tip-ups, fly rods, even bobber and bait. Also, we've included a detailed step-by-step bonus section on how to create boneless fillets for any size pike. Report illegal stocking immediately to your local ADF&G office, or to Fish and Wildlife Safeguard at 1-800-478-3377. 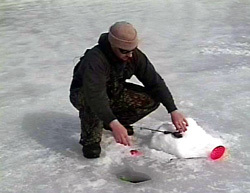 Do not transport live fish, especially northern pike, from one water body to another. Attend ADF&G Advisory Committee meetings, and other public fisheries meetings. Advisory Committees are located in nearly every Southcentral Alaska community. 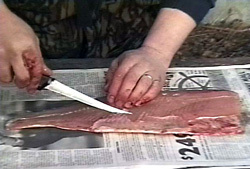 Advisory Committees make proposals to the Alaska Board of Fisheries, many of which have become fishing regulations.